“Meeting new people!” was the first thing everybody at the recent Cheers for Volunteers - Sem 1 2018 mentioned, when we asked about their reasons for volunteering . 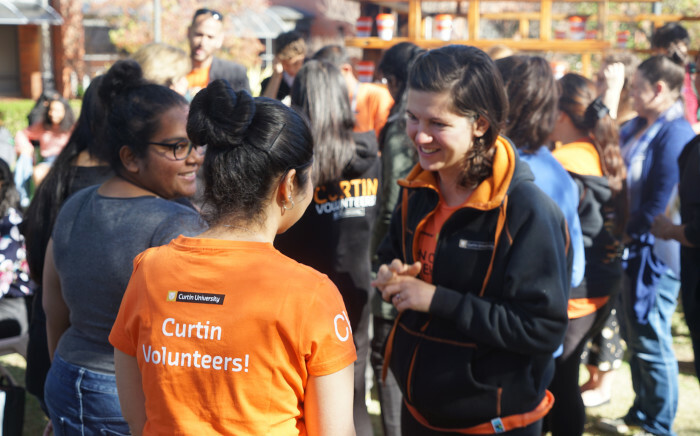 Being part of a big community like Curtin Volunteers! (CV!) gives you the opportunity to expand your networks. Plus you get to do some really good stuff. “Volunteering is about getting the chance to progress and challenge yourself to do things you’ve not done before. It’s also a good way to find new friends with the same interests. gaining practical experience and building new skills. Does what you do relate to your chosen degree? Certainly, there’s plenty of scope with programs, so it’s possible to find something that does relate to your course of study, e.g. like being part of the environmental program or working with young people on community projects. But, most of the students choose programs not related to their degree. This shows that volunteering programs initially attract students who are keen to make the most of their time at uni – it’s more about having fun, discovering interests outside your field of study and developing ‘soft’ or ‘employability’ skills. You can always find something that connects to your interests and fits with your values. Do you think future employers see volunteering as important? Employers definitely agree – they are very clear about employing students who have great communication skills, who can take the initiative to work on programs with teams, and can develop leadership skills. Employers always like to see someone engaging outside of their studies because it also shows commitment. Being part of CV!, therefore, provides a great opportunity to add to your resume. From the perspective of the employer – grades are not the only important thing they look at. Your uni engagement, employability skill development and practical experience are becoming more and more significant. Being a part of a large volunteering body like CV! gives you the chance to stand out from other students and to show that you are thinking outside the box. With all of the opportunities that CV! has to offer, both short term and longer term plus leadership opportunities, they are well worth connecting with. They also throw a pretty mean BBQ. This article was written by Career Development and Employability students Inga Prenger and Liane Dickmann, who are participating in a university work experience internship from Germany. Leadership Opportunities with Curtin Volunteers!